On 19th March 2018 the Bishops of Scotland signed their commitment to the new Safeguarding Standards set out in the policy document 'In God's Image'. 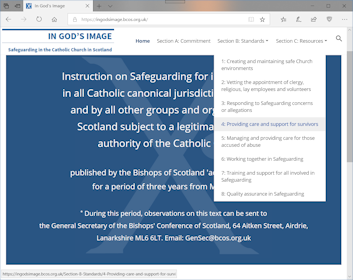 'In God's Image' has been published by the Bishops' Conference of Scotland as an "Instruction on Safeguarding for implementation in all Catholic canonical jurisdictions in Scotland and by all other groups and organisations in Scotland subject to a legitimate canonical authority of the Catholic Church". It is intended to explain and to direct the approach to Safeguarding that is to be practised at every level of the Catholic Church in Scotland. For the public, and for Catholic faith communities in particular, it has been written to explain how the Catholic Church in Scotland makes every effort to protect from all forms of harm and abuse those children and adults who are vulnerable or at risk. It has also been written to direct those who are responsible for managing Safeguarding arrangements in parishes, dioceses, Religious Institutes and Catholic organisations on how to comply with these new national Safeguarding standards. In God's Image lists a set of documents which are provided as are exemplars and templates that can be adapted for use by Dioceses, parishes and religious congregations.